3D Bubble Sound is the PUP that uses misleading techniques to prevent removal. Use Reimage to locate malicious components and get rid of them faster than with uninstall instructions. A full system scan blocks virus reappearance and prevents traffic to malicious domains. What is 3D Bubble Sound? How can 3D Bubble Sound hijack my computer? How to remove 3D Bubble Sound virus? 3D Bubble Sound (also known as 3DBubbleSound 1.0) is a free software developed by Asia Soft Interactive Advertising Ltd. It is promoted as a “high-end HiFi emulator on PC.” However, before you fall for believing that this tool is going to change your music listening experience, you should know some additional information about this tool, not only what its developers claim. Our security experts have tested this application because its distribution method raised some suspicions. It has been revealed that 3D Bubble Sound is spread in a form of a browser add-on along with other freewares like, for instance, download managers and media players. That’s why it has been attributed to the category of ‘potentially unwanted programs’ (PUPs). Besides, don’t expect that this application will bring you any benefit. It’s ad-supported or, in other words, a typical adware, what means that its main task is to display sponsored ads and generate advertising revenue. If it manages to infiltrate a target system, usually it settles down on all web browsers that it manages to find and activates an add-on on each of them. Right after that, you may start noticing that web browser’s performance has diminished, as well as an increased number of crashes. On top of that, you may be unable to browse the net normally due to an excessive amount of commercial advertisements. 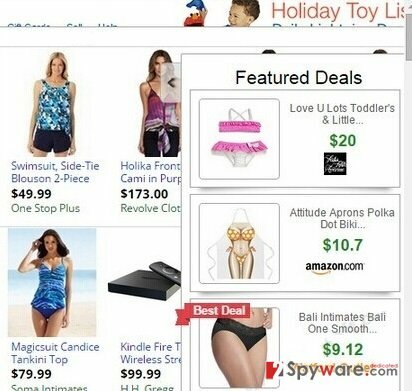 This adware is programmed to display sponsored pop-ups, banners, and in-text links that are labeled as “Ads by 3D Bubble Sound” or “3D Bubble Sound Ads” that contain links to predetermined websites. Draw your attention to the fact that those ads are prepared and monitored by third parties who freely promote whatever they want. The problem is that some of the 3D Bubble Sound redirects may lead you to the websites that promote other PUPs or even malicious software. On top of that, by keeping this adware installed you also risk disclosing personally and non-personally identifiable information to suspicious third parties. To prevent data leakage and risk-posing redirects, you should remove 3D Bubble Sound virus right away. For that, you may use Reimage or another reputable anti-spyware. 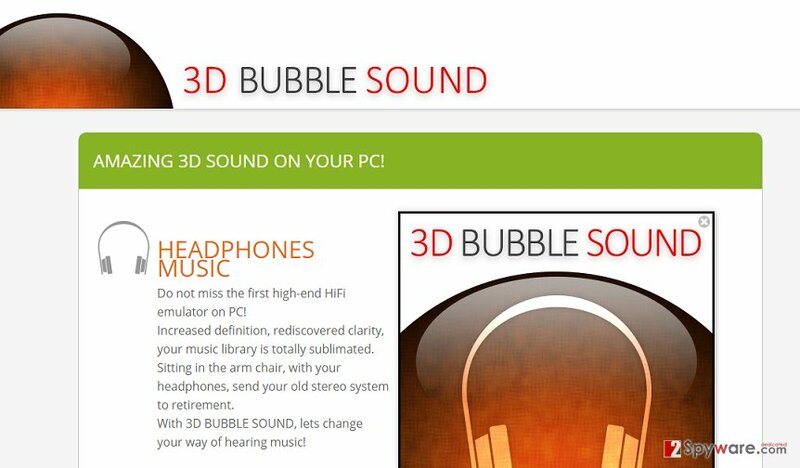 3D Bubble Sound is a typical adware in all its sense. One of the factors that predetermines the categorization of it as a potentially unwanted program is its distribution method. Usually, it is spread bundled with other freewares and sharewares, so it’s not surprising why so many people have installed it without even realizing that. In order to prevent stealthy infiltration of various PUPs, stop thinking that its enough to click the ‘next’ button in order to install a freeware. Instead of that, you should opt for Advanced or Custom installation option, monitor every step, and opt out of all ‘optional downloads’ that you spot. Keep in mind that although various add-ons, plug-ins, toolbars, and extensions may be promoted in a very appealing way, most of the are ad-supported or set to hijack your web browser. Here, look for 3D Bubble Sound or any other recently installed suspicious programs. Wait until you see Applications folder and look for 3D Bubble Sound or any other suspicious programs on it. Now right click on every of such entries and select Move to Trash. When in the new window, check Delete personal settings and select Reset again to complete 3D Bubble Sound removal. Once these steps are finished, 3D Bubble Sound should be removed from your Microsoft Edge browser. Here, select 3D Bubble Sound and other questionable plugins. Click Remove to delete these entries. Now you will see Reset Firefox to its default state message with Reset Firefox button. Click this button for several times and complete 3D Bubble Sound removal. Here, select 3D Bubble Sound and other malicious plugins and select trash icon to delete these entries. Click Reset to confirm this action and complete 3D Bubble Sound removal. Here, select Extensions and look for 3D Bubble Sound or other suspicious entries. Click on the Uninstall button to get rid each of them. Now you will see a detailed dialog window filled with reset options. All of those options are usually checked, but you can specify which of them you want to reset. Click the Reset button to complete 3D Bubble Sound removal process. This entry was posted on 2015-09-16 at 23:07 and is filed under Adware, Viruses. You can quickly scan the QR code with your mobile device and have 3D Bubble Sound adware manual removal instructions right in your pocket. How did you remove 3D Bubble Sound adware?